This angled country ranch warms up the neighborhood with a unique combination of exterior materials and shapes. Both the family room and great room gain added drama from cathedral ceilings and open to a large wrapping deck. The master suite features a private deck, cathedral ceiling, his and her walk-in closets, and a spacious bath with every amenity. Two family bedrooms share a generous hall bath. 1st Floor: 1842 Sq. 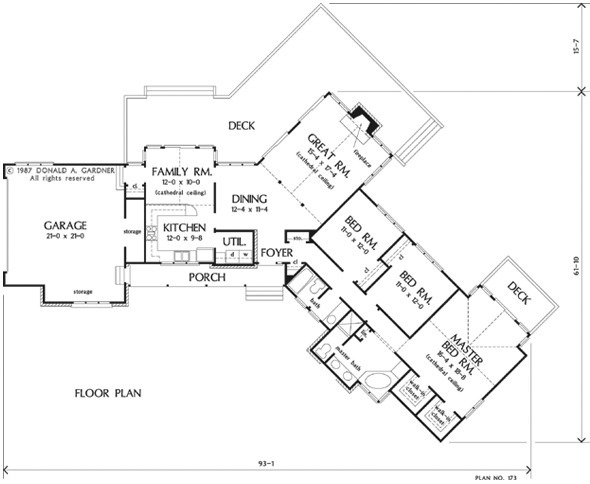 Ft.
House Dimensions: 93' 1" x 61' 10"
Great Room: 15' 4" x 17' 4"
Master Bedroom: 16' 4" x 18' 8"
Porch - Front : 28' 0" x 4' 0" x 0' 0"
Porch - Rear : 12' 8" x 7' 0" x 0' 0"
Deck / Patio : 23' 6" x 12' 0" x 0' 0"
Storage (Other) : 4' 0" x 1' 8" x 8' 0"
Other (Cathedral): 12' 0" x 10' 0" x 12' 0"
Foyer : 4' 10" x 6' 2" x 8' 0"
Dining Room : 12' 4" x 11' 4" x 8' 0"
Great Room (Cathedral): 15' 4" x 17' 4" x 13' 0"
Kitchen : 12' 0" x 9' 8" x 8' 0"
Utility Room : 6' 6" x 5' 8" x 8' 0"
Garage Storage : 3' 2" x 11' 8" x 0' 0"
Master Bedroom (Cathedral): 16' 4" x 18' 8" x 13' 0"
Bedroom #1 : 11' 0" x 12' 0" x 8' 0"
Bedroom #2 : 11' 0" x 12' 0" x 8' 0"